No. 61, Jalan Mutiara Emas 5/26, Taman Mount Austin, 81100 Johor Bahru, Johor, Malaysia. During 1996 our company was started with GL Engineering Support, during that time we are only a dealer to selling and buying others company's products like machinery and spare parts. 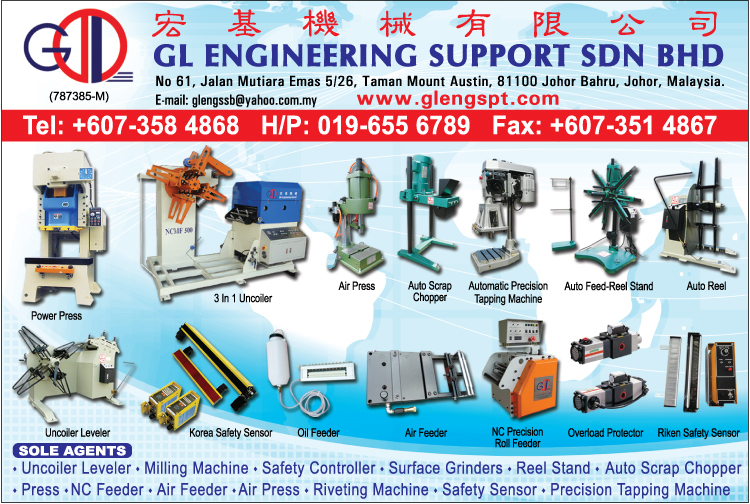 GL ENGINEERING SUPPORT SDN BHD was established in 2008,and sole agent in Malaysia for brand product which coved a wide range of Air Feeder, Uncoiler & Leveller, Precision Tapping Machine, Milling Machine, Reel stand, NC Feeder, Press, Safety Controller, Scrap Chopper, Air press and spare parts of machinery. We also provide our technical services. Now a days, we not only act as dealer of others machinery band, we are also undertake on commercial projects and provide support in establishing production line. 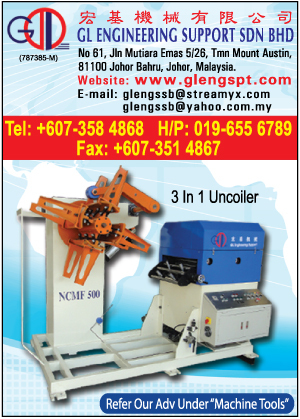 Besides, we also undergo long term contract with machinery repair and maintenance with our clients. 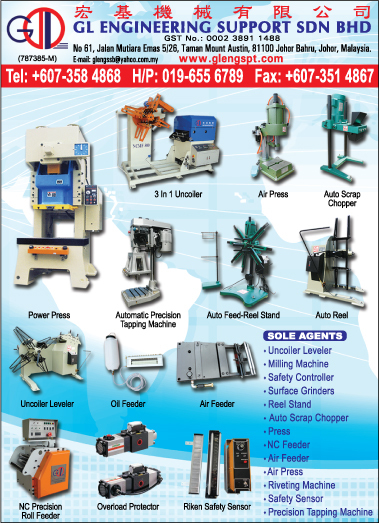 Machining service also available in our company to modify and upgrading the machinery and increase it functionality. In addition we also provide costumed made machinery, based on customer's need to create the most suitable machine. Recently, we are also working hard in generate our own brand of machinery. USED BRUDERER PRESS MACHINE 30 TON.